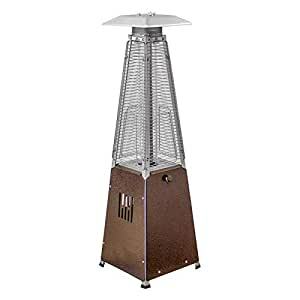 Fire up the Patio Heater Bronze Portable Glass Tube Tabletop Heater and watch your patio party heat up. This exciting tabletop heater puts all the focus on a fiery-hot quartz glass tube that burns with 9,500 BTUs of heating power. It’s surrounded by a safety cage and supported by a no-tilt four-legged base, as well as outfitted with a thermocoupler for safety. You control the level of heat via an underside access door that hides a standard 1-pound propane tank (sold separately). CSA approved.